PC's Blog: Check out Holly's Fun With Photoshop! Check out Holly's Fun With Photoshop! Holly Rodgers sent me this lovely photo. I think she makes an excellent vampyre! Holly: well done you! I love Holly! She is a hot zombie/vampire too, huh? Is there any chance I can show you my photo also? Yoyo - sure. Just send it to my personal assistant, Camden at: camdenclark.pa@gmail.com. Have you caught up on your emails yet PC? from someone who religiously read all books in 4 days, heath pisses me off! i've been waiting for you to kill him off actually... haha. Y? I never understood why people hate Heath. Especially at my school. I only know one person who reads the house of night series and thinks Heath is okay. WTF is up with that? LL - I have a theory about why some kids (girls, usually) don't like Heath. I think it's because they want the fantasy of a boyfriend who is larger than life and magical and extraordinary, versus the real thing. Heath is just this sweet, kinda cool, cute, REGULAR guy. No superpowers. No vamp stuff. Just a guy. So they discount him. Sorry...I know that's depressing for those of you who are, well, just guys. Chin up,though, dahling, THERE ARE NO VAMPYRES. So you're set. *has a heart attck* I cannot believe you're doing something like this!!! House Of Night Is the best thing to ever happen!!!!!! I cannot wait until TEMPTED comes out!! *does a happy dance* I'm so doing this!!!!! Thanks so much P.C.!!!!!!!! My name's carolina and i'm from Portugal. In may Marked was appear in the portuguese market and as a twilight fan i also loved to read marked. But, unfortunately, we just have the first book. I was amazed when i saw the others book in house of night's site. I'm sorry about my english, but i just want to say that i'm a big fan from your write. I'm excited to see the rest of the story. 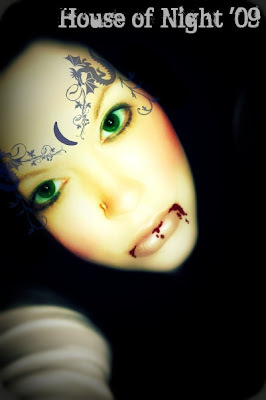 Hey i was wondering how you put the vampire marks on your picture on photo party ?? Oooh! A contest! Free HoN stuff! Ooooh! A cover I CAN show you!